Railfan Day on the Red Springs and Northern Railroad! 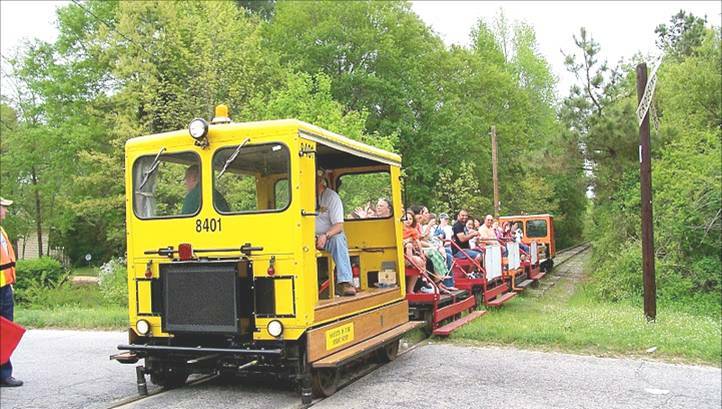 This is your chance to ride our Motor Car train on the entire railroad, from Red Springs, NC to Parkton, NC and return, traveling through Shannon and Lumber Bridge, through the flat Eastern North Carolina farming country, and by the many mysterious Carolina Bays along the line. Total mileage will be about 11.5 miles each way on the original Bennettsville Branch of the Atlantic Coast Line (originally part of the Cape Fear and Yadkin Valley Railroad), which hasn’t seen a passenger train in over 60 years! Our train consists of open-air trailer cars with bench type seating being pulled by class A railroad speeders. A very limited number of speeder tickets may be available that morning for a $10 upcharge. Trips will depart from Red Springs, NC at our yard at Vance and Robert Streets, where there is plenty of parking. We will have one photo stop on each trip as we travel through the swamps and farmland enroute to Parkton. We will enjoy a 45-minute layover in Parkton to visit our Parkton ACL depot/museum, purchase a drink and snack, and watch some CSX mainline freight train action before we return to Red Springs. Fares are $15.00 per adult and children ages 5-12 are $10.00 each. This trip is not recommended for children younger than five due to our open cars. An All-Day pass for all three trips is $40.00 for the day. Due to the historic nature of our equipment, it will be difficult to host handicapped passengers. Restrooms and Drinks and Snacks are available in Red Springs, Lumber Bridge and Parkton. Third trip departs Red Springs at 3:30 pm and returns at 6:45 pm. You should arrive at our boarding site 30 minutes before your trip to allow ample time for parking, getting tickets, and boarding. Order Tickets Today, Capacity is Extremely Limited!!! For further information or to make reservations, please contact Carey Boney at 910-285-7489 between the hours of 6 pm and 9 pm daily, or via email at careyboney@embarqmail.com. Reservations will be held for one week to allow time to mail checks or money orders to: Red Springs and Northern Railroad, c/o Carey Boney, 1605 Powers Road, Wallace, NC 28466. Tickets may be available on the day of the trips, if not previously sold out. All reserved tickets will be available in Red Springs one hour before boarding. No tickets will be mailed out. A list of hotels is available upon request. The railroad reserves the right to cancel, reschedule trains and operating days or to substitute equipment, or adjust the trip length as required or necessary.